FFA MEMBERS SPEAK THEIR WAY INTO THE RED BLUE AND GOLD. According to www.inc.com on average, every corporate job opening attracts 250 resumes, but only four to six of these people will be called for an interview, and only one of those will be offered a job. While this is the case for real world jobs it wasn't the case for some FFA members who participated in speech and job interview competitions on January 18th. The contestants didn't go into this competition unprepared, in fact, speech competitors started working on their speeches in December and performed them in front of the class for a grade. 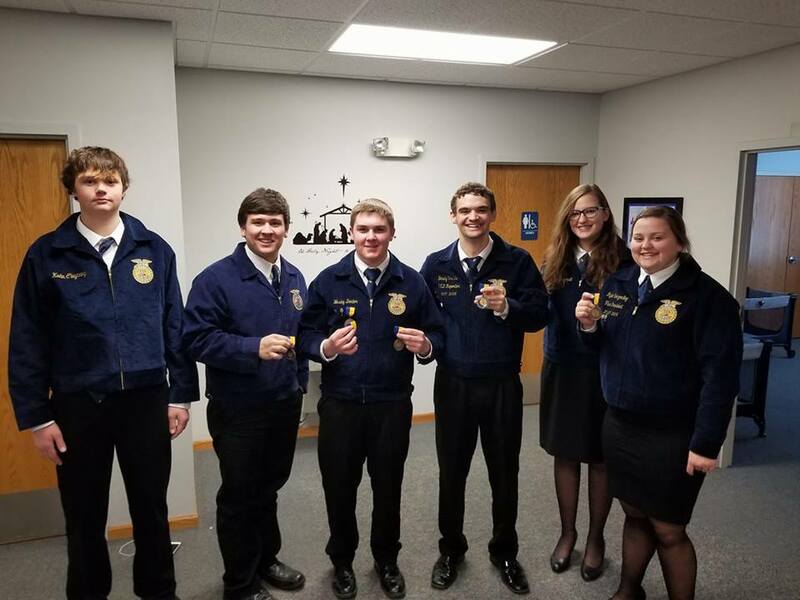 While the job interview competitors prepared by having mock interviews in front of the class, on the Sunday before the competition, some alumni FFA members volunteered to interview the competitors. FFA members who participated in speech competitions were Wes Denton, Sophie Brungardt, Kadin Claycamp and Colton Crook. Out of the speech participants Wes placed 1st in the Junior Division. The contestants in Employment Skills (job interview) were A team Wes Denton 1st and and state qualifier. and Brady Trimble 2nd and state qualifier. On the B team was Dalton Joseph 2nd, and Rylie Borgerding 3rd. “ The job interview contest has prepared me for a real interview because up until we started Job Interview I was clueless! I feel like practicing this skill will help me secure a job in the future.” said Rylie Borgerding, So.